The Grand takes you on a memorable journey through époques setting the playground to the early dawn of the 20th century. Designed in a refreshing Art Deco style, this is a challenging video slot machine produced by Quickspin built on a 3-3-4-4-5-5 layout with no less than 214 ways to score a big win. 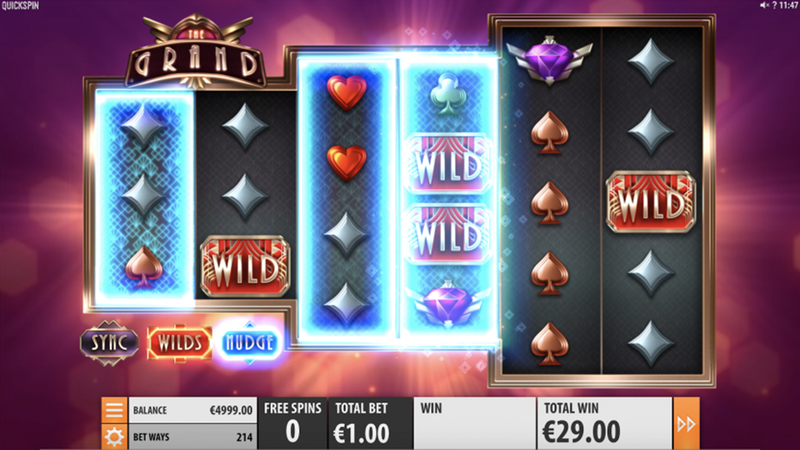 Equipped with Wilds, Scatters, Free Spins, and Combo Features, the game made it possible for prospective winners create a stack of multiple features on a single spin. At the first glance, the rulebook looks quite familiar asking at least 3 symbols of the same kind to be lined up on adjacent reels from the leftmost. This is how you get paid, right? A wide majority of modern games allow payouts for only 2 higher-paying items, but this is still vague info on which we gather something more liable. When it comes to the setting itself, you’ll be playing in luxurious rooms with lively decorated walls and furniture making a sophisticated gaming experience you won’t regret trying. A combination of lower-paying icons representing 4 main card suits and diamonds of all kinds and shapes is what you’ll search for in order to receive some cash. Surely, the same set of rules stands for The Grand Free Play and real money modes. When 3+ Scatters appear anywhere on the reels, lucky winners will receive a number of The Grand Free Spins and get to chose 1 out of 3 rewarding features – extra spins, Sync or Nudge. Let’s just wait and see what you can get out of the last 2 mentioned. Also, we saw Wilds appearing in The Grand Demo, meaning they can replace all other items but the Scatter and improve the payline at the same time – it would seem like a standard option. Moreover, when 3+ Bonus items appear on the reels 3, 4 and 5, The Grand Bonus feature will turn on awarding the bravest with 1 rewarding feature + 1 free spin. A screenshot is worth a thousand words, right? Here you go! But in the end, you have to try The Grand yourself – one of the recommended casino sites should fit perfectly!